Just in time for your get-healthy, be-stronger, love-your-body resolutions for the coming New Year ...we proudly announce our 30 DAY YOGA CHALLENGE. - Each days practice will be a unique dynamic sequence focusing on strength, stability, mobility and flexibility. - In every day’s 75 Minutes class we thrive to learn and practice the dynamic sequence and eventually progressing into the new peak pose. The sequence of the class revolves around the peak pose including the sun salutations, poses for strength and flexibility and drills using props. - The peak poses learned the earlier day keeps on adding into the next day’s practice sequence hence making it more adventurous and exciting. - We commit to explore our own potential, go beyond our comfort zone and be receptive to learn, adapt, modify to these exciting new 30 poses throughout the challenge. - This mega yoga challenge will be combined with recommended healthy and clean diet plan that will help you make small changes throughout the month leading to long term benefits. - It takes 21-30 days to rewire your neural connection in your brain to create a new habit. This program constantly encourages the mind, body and soul to be more present, open-minded and to learn more. - It can help change the way the brain “thinks” by, over time, creating and strengthening new neurons and neural pathways to help get out of old baggage/habits and stuck old ways of thinking. - The challenge aims to learn on the mat - deep calm breathing, softening muscles, clearing the mind and enjoying the present moment and bringing it into our daily lives off the mat. - Whatever you may be dealing with can be healed, transformed and you can break through to the next level. You learn to be you own magician to create miracles, or be your own healer to create happiness in your life. - Disciplined actions be on time every single day & prioritizing ones healthy habits. - Being committed to not give on one self. - Persistence to be complete the challenge. - Belief and trust that anything and everything is possible. There’s something very special about her classes, it’s a mix of her voice, articulation, method instructions, and the mediations. But I believe it’s mainly the energy she exerts. With Alpa, it’s all about what you are doing, how you are challenging yourself, and most importantly, why are you doing this: for yourself; to heal, to feel better, to detox, to let go, to build confidence, to recentre. Each class starts and ends with a few minutes of meditation. Throughout the session, Alpa spends a good percentage of her time focusing on every individual whether it’s correcting their pose, or pushing their abilities even more. There are 3 wonderful lessons I learned through this challenge. 1) To be patient- yoga has taught me that good things come to those who wait. 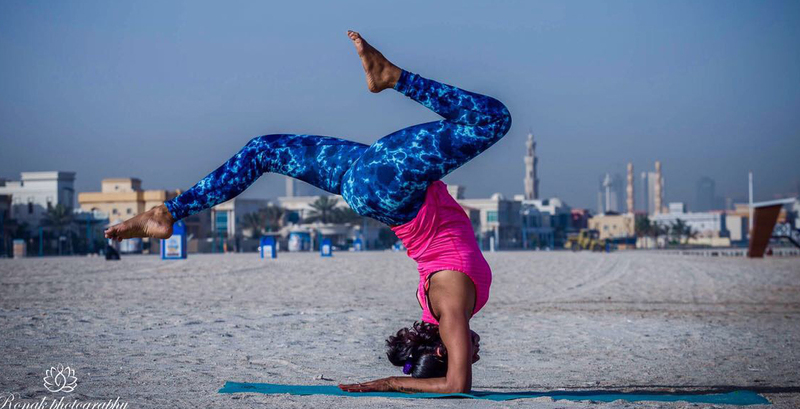 More challenging poses seemed impossible when I started yoga, but with regular practice and perseverance, I have been able to learn poses that once seemed impossible. 2)To Listen- When I first started yoga; I had to watch the instructor intently because the poses and terms were new to me. But over time, I have been able to move through my practice by listening to the teacher’s cues; sometimes I even close my eyes to help myself focus. 3) To Breathe- As I learned to breathe in yoga, I started to become more aware of my breath outside of my practice.